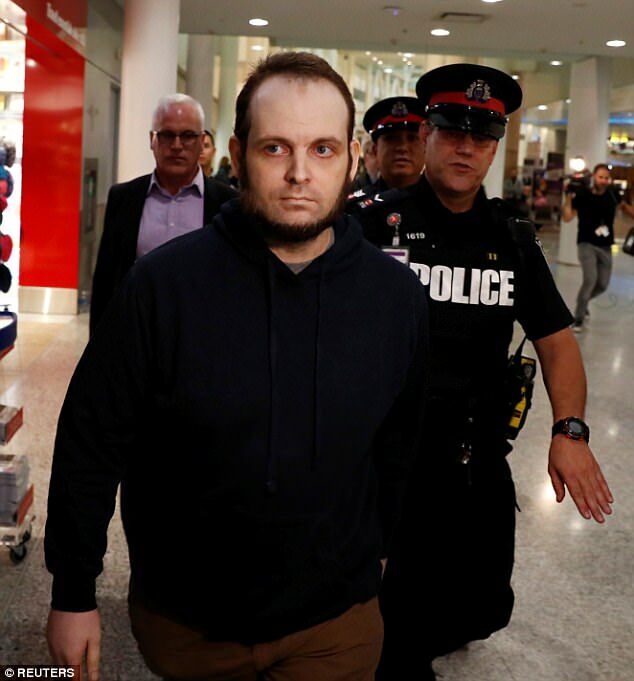 Ex-hostage, Joshua Boyle, who was recently freed from captivity in Afghanistan with his wife and children, has been arrested on 15 charges, including sexual assault. 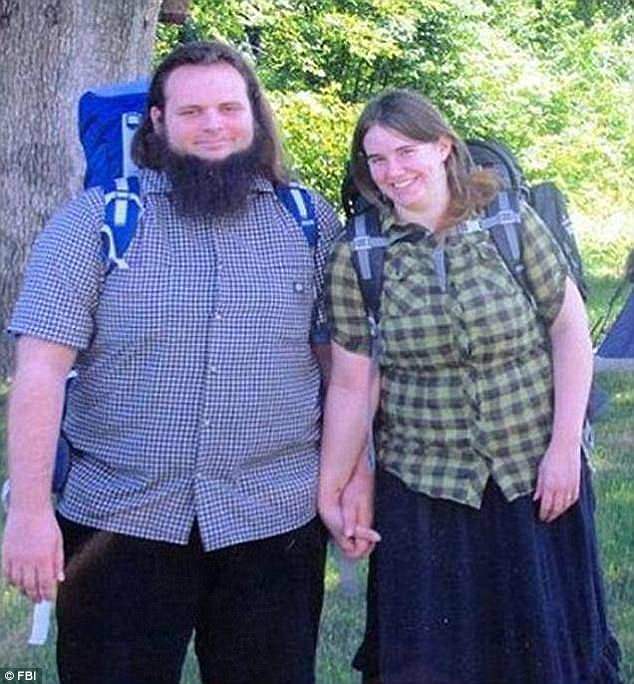 Boyle, of Canada, his American wife Caitlan, and their three children were rescued last October in Pakistan, five years after the couple was abducted by a Taliban-linked militant group while on a backpacking trip in neighboring Afghanistan. 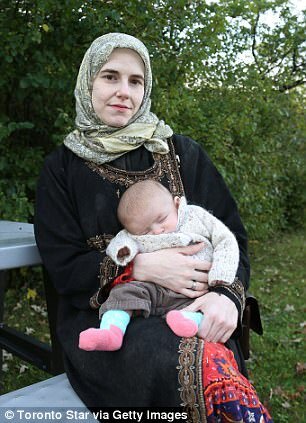 The children - 2- and 4-year-old boys and an infant daughter - were all born in captivity. Authorities said the charges against the 34-year-old include eight counts of assault, two accounts of sexual assault and two counts of unlawful confinement. Boyle was reportedly charged with one count of causing someone to 'take a noxious thing, namely Trazodone,' an antidepressant, court documents indicated Tuesday. There is also a charge of uttering a death threat and a charge of misleading a police officer. The purported acts allegedly occurred between October 14 - the day after the family returned to Canada - and December 30. A publication ban bars reporting any information that could identify the alleged victims, of which there are two. Boyle made his first appearance in Ottowa court on New Year's Day and remain in police custody. He is expected to appear in court again on Wednesday via video link. Ottawa police declined comment. Eric Granger, Boyle's attorney, said he had not seen the court documents yet. 'Mr Boyle is presumed innocent. He's never been in trouble before. No evidence has been provided yet, which is typical at this early stage. We look forward to receiving the evidence and defending him against these charges,' Granger said in an email. 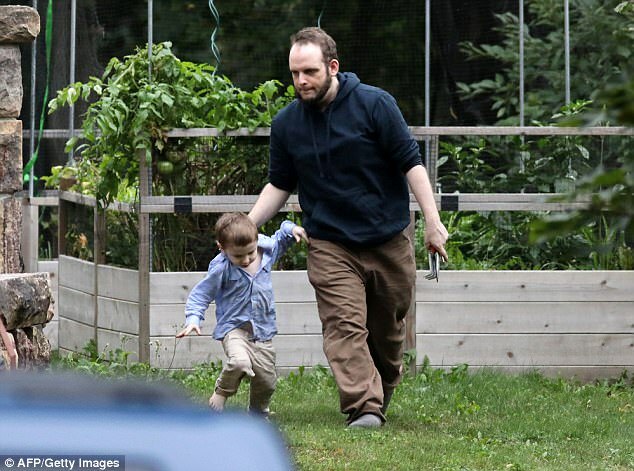 When the family returned to Canada in October, they briefly stayed with Boyle's parents in Smith's Falls, Ontario, but have since moved to an apartment in Ottowa. A man who answered a call at Boyle's parents' home on Tuesday told CBC that 'we don't have any comment'. According to reports, Caitlin's parents have traveled from the U.S. to support her and her children. Boyle told the AP in October that his wife had been hospitalized in Ottawa, but did not specify why she was taken to the hospital. 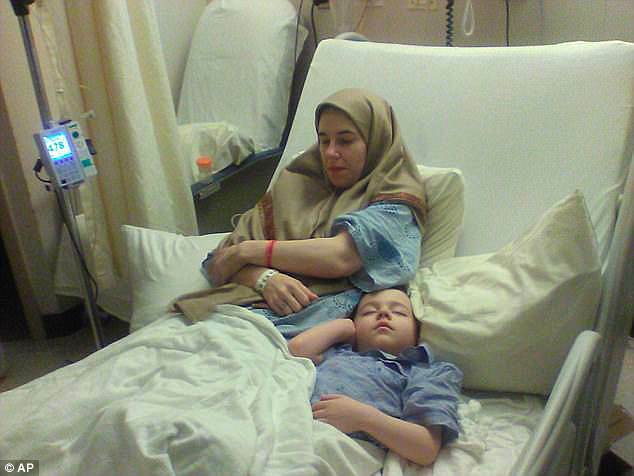 He took a picture of her in her hospital bed and emailed it to the AP. 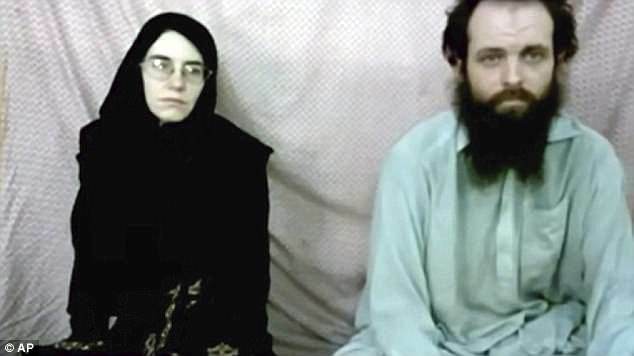 During their captivity, the couple claimed that their guards forced Caitlan to undergo an abortion and even raped her. The group has denied the accusation of sexual assault and the forced abortion, going on to say that Caitlan suffered a miscarriage. He also told the AP that he and his wife decided to have children even while held captive because they always planned to have a big family. Boyle said then that their three children were 4, 2 and 'somewhere around 6 months'. 'Honestly we've always planned to have a family of 5, 10, 12 children... We're Irish, haha,' he wrote in an email in October. 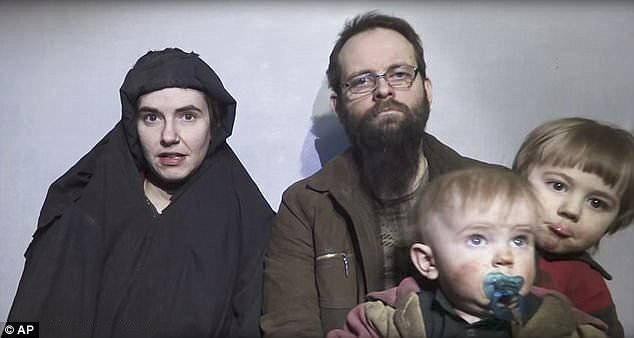 The parents of Caitlan Boyle, who is from Stewartstown, Pennsylvania, said after the rescue that they were elated she had been freed, but they also expressed anger at their son-in law for taking their pregnant daughter to Afghanistan. Pakistani troops rescued the family in an operation October 11 aimed at their captors, the Taliban-linked Haqqani group. The Pakistanis caught the Haqqani fighters at some point after they had moved with their captives across the border from Afghanistan. Caitlan said that they were being moved in a car when they came under fire and were rescued by the Pakistani forces. 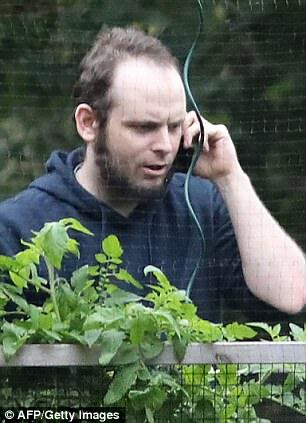 Boyle said he was hit by shrapnel in the incident and that the last thing he heard his captors say was 'kill the hostages'. Pakistan's Foreign Ministry said the operation was based on a tip from US intelligence. 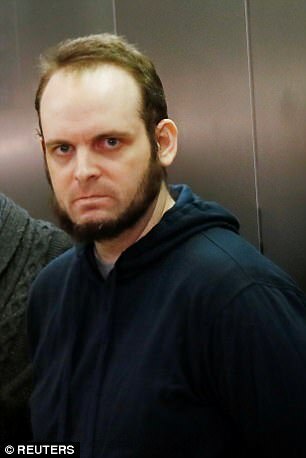 Boyle was once briefly married to Zaynab Khadr, the older sister of former Guantanamo Bay detainee Omar Khadr and the daughter of a senior al-Qaida financier who had contacts with Osama bin Laden. The Canadian-born Omar Khadr was 15 when he was captured by US troops following a firefight and was taken to the US detention center at Guantanamo Bay. Officials had discounted any link between that background and Boyle's capture, with one describing it in 2014 as a 'horrible coincidence'. Boyle and his family met with Canadian Prime Minister Justin Trudeau in the leader's office last month. 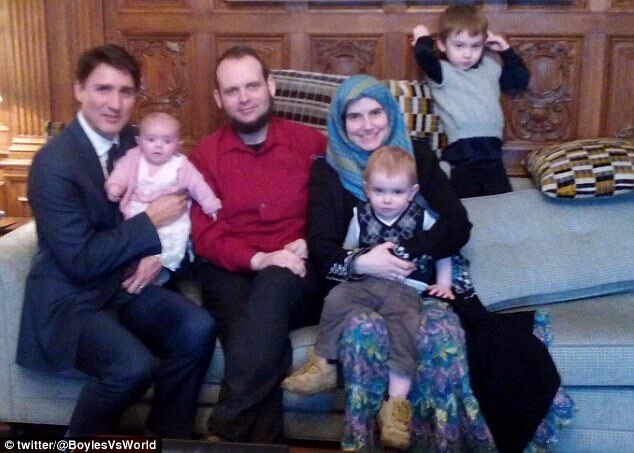 A Twitter account named 'The Boyle Family' with the handle @BoylesVsWorld posted photos of Boyle, his wife, and their three children inside what appears to be the prime minister's Parliament Hill office. Many are now questioning Trudeau's wisdom for agreeing to the visit and have questioned whether Boyle was already under police investigation at that time. In a statement Trudeau's office said the meeting was arranged at the request of the family and that the prime minister would always agree to meet freed Canadian hostages. The discussion of the hostage-taking was the main purpose of the meeting with the Boyles, a government official told www.metronews.ca. The Prime Minister's office wouldn't comment on the charges due to the ongoing investigation. In September, Trudeau he couldn't imagine what the family were going through. In a separate tweet Boyle revealed he had met Trudeau previously, back in 2006 before he had left for Afghanistan. He did not elaborate on the purpose of the meeting.